Digital X-ray holders help position digital sensors while taking an x-ray. They can be disposable or reusable. If reusable they should be autoclavable. 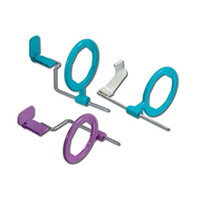 Patient comfort should be a consideration, and there are many digital sensor x-ray holders to choose from. If choosing disposable, there are biodegradable digital x-ray holders for the environmentally friendly conscious practice. If your practice uses a phosphor X-ray device, be sure the digital x-ray holder you select is phosphor plate compatible. Also, be sure when choosing this product that your order includes horizontal bitewing, vertical bitewing, anterior PA and posterior PA for all necessary x-rays, some vendors include all of these in a kit, others sell them individually.